Hi Friends! Happy New Year to you and yours! I hope this year brings about the changes and promises you would like to see for your selves! I always like to think about the new year as a new beginning! I don't know about you, but I need a new beginning. I'm looking forward to 2013 and all that it has in store for me and my family! So with that in mind I'd like to think that I started the year off right, by blogging! I decided to participate in a month long challenge with Ultimate Blog Challenge - the challenge is for me to blog every day for the entire month. You can read more about this challenge here. If you are a blogger, there's still time to participate in the challenge. I'm excited about this challenge; it will help me to stay on schedule when blogging and that's good for you my audience and good for me. 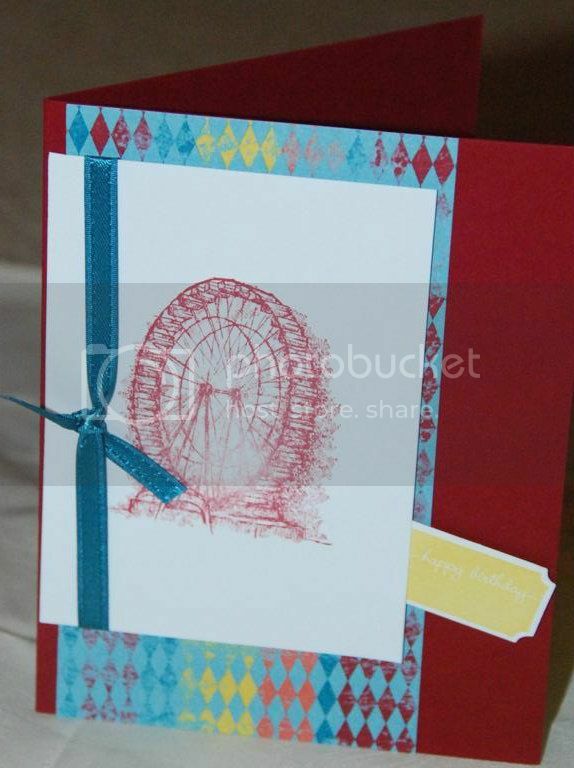 So stay tuned with me this month as I share with you new stamping products that will become available from Stampin' Up! on January 3! Did you receive your Spring catalog in the mail, if not let me know and I can get you a copy. I didn't get to stamp today, but I wanted to share with you one of the birthday cards I received from Jenn - it uses Spring catalog products free products that you can receive during Sale-a-bration.